Sister Nielson was teaching the Sunbeam class. She held a picture of Jesus showing His wounds after He had been resurrected. “You mean He lived again after He was dead?” Heather asked. How did three-year-old Jake know that Jesus lived again? How did he know that he too would live again? Each week Jake listened to Sister Nielson’s lessons. She taught about Jesus and bore her testimony. Jake listened to his parents during family home evening and at other times. They taught about Jesus and bore testimony of Him. The feeling in Jake’s heart told him to believe the words of his teacher and parents. After Jesus was resurrected, He showed Himself to His disciples. Thomas was not with them. The other disciples told Thomas they had seen Jesus. But Thomas said, “Except I shall see in his hands the print of the nails, and put my finger into the print of the nails, and thrust my hand into his side, I will not believe” (John 20:25). Eight days later Jesus did show Himself to Thomas. Jesus let Thomas feel the nail prints in His hands and touch His side. Then Jesus said, “Thomas, because thou hast seen me, thou hast believed: blessed are they that have not seen, and yet have believed” (John 20:29). Like Jake, we can believe in Jesus even though we do not see Him. Our faith will grow when we know, without seeing, that Jesus is our Savior. Mount page 14 on heavy paper, and cut out the pictures of Jesus, Mary Magdalene, the Apostles, and Thomas. Fold the tabs along the broken lines so the figures can stand up. 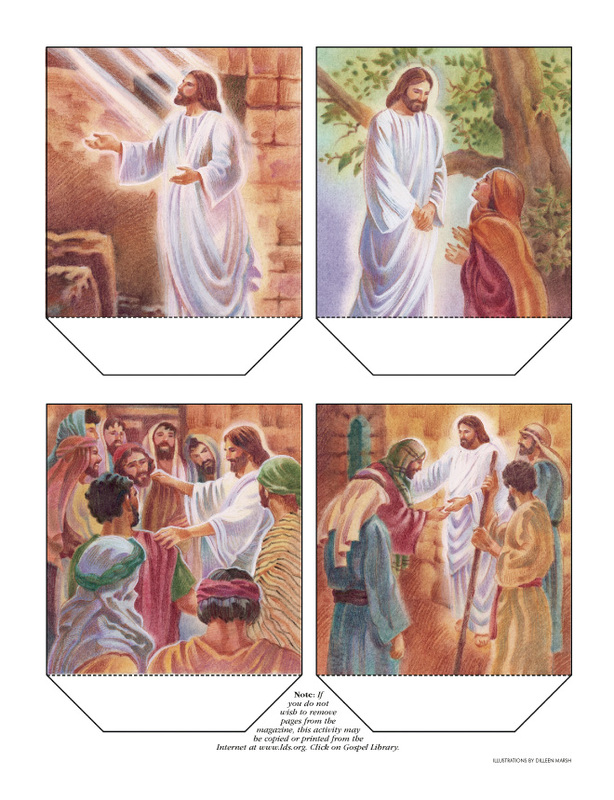 Tell your family the story in John 20 of each person seeing the Savior after His Resurrection. Note: If you do not wish to remove pages from the magazine, this activity may be copied or printed from the Internet at www.lds.org. Click on Gospel Library. 1. Explain that Jesus Christ came into the world to do the will of the Father. Discuss what the Father’s will is. Help the children memorize D&C 19:24 by dividing the children into three groups. Have the first group say, “I am Jesus Christ.” Have the second group say, “I came by the will of the Father.” Have the third group say, “and I do his will.” Repeat, rotating so that each group says each part. Sing the chorus of “Nephi’s Courage” (pp. 120–21). Ask the children to notice the word will. Divide the group in half, and invite the first group to chant the chorus’s words in rhythm but without singing. Have them clap on each syllable. Have the second group clap and chant, “I will go; I will do” four times. Then have the groups clap and chant together. Explain that Jesus’s mission was to do the will of the Father. Our mission is to follow Heavenly Father’s commandments. Bear testimony that Jesus fulfilled His mission and that we will be blessed as we keep the commandments. 2. Display three shoe boxes, and ask the children to raise their hands if they like to try on new shoes. Explain that you want them to imagine trying on some other people’s shoes, but more important you want them to imagine what it would be like to actually be that person. One by one, take out a pair of shoes from each box. (You can also display pictures or drawings of shoes.) Show a pair of boots to represent the soldiers who guarded Jesus’s tomb. Use detail to tell the story in such a way that the children can imagine being there when Jesus Christ was laid in the tomb. Next, use a pair of sandals to tell the story of Mary Magdalene. Ask the children how it might have felt to have been at the garden tomb when the resurrected Savior appeared. Last, show a pair of shoes that children in your area commonly wear. Ask how it feels to be a member of the Church and to have the knowledge that you will be resurrected because of the Atonement and Resurrection of Jesus Christ. Sing “Did Jesus Really Live Again?” (p. 64), and bear testimony that the Easter story is the most glorious story in the world. Testify that Jesus Christ is the Son of God and that He died and was resurrected. 3. Using pushpins, a bulletin board, and brightly colored yarn, write the word wrong at the front of the room, using yarn to create each letter. Tell the children that when they repent they turn wrong into right. Ask the children to help you turn the word wrong into right by figuring out what they could do to repent. Use three case studies (see “Case Studies,” TNGC, 161–62) to give situations where children need to repent. After the first case study, have a child remove the w and form it into a t. Sing “The Fourth Article of Faith” (p. 124), and explain that repentance is the second principle of the gospel. After the second case study, have a child make the n into an h. Sing “Repentance” (p. 98). After the third case study, have a child shape the o into an i without the dot. Sing “Help Me, Dear Father” (p. 99), and explain that we need to forgive others who repent. Use a sticker to put a dot above the i. Put a dot on each child’s right hand, and explain that it is to help them remember to choose the right and to turn wrong into right. Put the letters in order on the board. Recite from My Gospel Standards, “I will choose the right. I know I can repent when I make a mistake.” Bear your testimony of repentance and of the Atonement of Jesus Christ. 4. Tell the children that you are going to ask them a trick question. Ask, “How many prophets do we have on the earth today?” Explain that each member of the First Presidency and the Quorum of the Twelve Apostles is sustained as a prophet, seer, and revelator. That means that we have 15 prophets on the earth! Explain, however, that the President of the Church is the only one who can receive revelation for the entire Church. A week before general conference, ask several older children to report in two weeks on a message that an Apostle gave at general conference. If possible, display a picture of that Apostle as each child tells about the message. Sing “Latter-day Prophets” (p. 134), but substitute the names of our living prophets. (You can find their names in order of seniority on the masthead of any Church magazine.) Begin with “Today’s living prophets are: number one, Gordon B. Hinckley; Thomas S. Monson …” Substitute the names of the First Presidency and the Quorum of the Twelve Apostles, fitting the names to the music. End with, “We hear and follow their words today.” Share with the children an experience you have had with one of the Apostles, either in person or by reading his words. Testify that these men have been called of God and that they are leading our Church today. Promise the children that their faith will grow as they heed the counsel of today’s living prophets. 5. Song presentation: “I Know That My Redeemer Lives” (Hymns, no. 136). Invite the children to look up D&C 76:22. Preface the scripture by explaining that Joseph Smith and Sidney Rigdon had a vision. Read the scripture together. Point out the exclamation point at the end. Ask the children to read the scripture again and say the last two words with enthusiasm, “he lives!” Tell them that those two words are in a beautiful hymn. Ask them to count how many times you sing “he lives.” Teach the chorus first. Divide the Primary into four groups. Have each group sing one phrase that begins with “He lives.” Combine the four groups into two groups and then finally into one group. 6. Friend references: “He Lives,” Apr. 2006, 2; “Easter Lilies,” Apr. 2004, 7; “Why We Rejoice,” Mar. 2005, 10; “Don’t Delay,” June 2004, 43; “Washed Clean,” Apr. 1999, inside front cover; “He Lives!” Apr. 1972, 48; “Jesus Is Crucified,” Apr. 2003, 13–15; “Jesus Is Risen,” June 2003, 10–15.